"What man of you, having a hundred sheep, if he has lost one of them, does not leave the ninety-nine in the wilderness, and go after the one which is lost, until he finds it? And when he has found it, he lays it on his shoulders, rejoicing. And when he comes home, he calls together his friends and his neighbors, saying to them, `Rejoice with me, for I have found my sheep which was lost.' Just so, I tell you, there will be more joy in heaven over one sinner who repents than over ninety-nine righteous persons who need no repentance." I just recently learned of two deaths. A young child died in the family swimming pool. A man in good health fell off a roof to his death. How can we explain this? What is God's plan? Where are the souls of these people now? And what can we do? Imagine the pain of their loved ones. One day they were sitting at dinner, laughing. And in an instant, they were gone. That night as I prayed the sorrowful mysteries of the Rosary in memory of these unfortunate souls, I found myself entering into deep meditation on the Crucifixion. I could imagine Jesus at the moment of His death, His head falling forward and to his right; then the order from the captain of the guard to pierce Him with a lance to confirm He was dead; and the blood and water emerging from His side. The sorrowful mysteries end on this sad note. We are forced to confront the death of Our Lord. We know He will rise again, but at the moment the world becomes a dark place. Death seems to have conquered all; as Our Lord descends into the dead to recover the lost souls of the Old Testament patriarchs. Darkness falls as the Sabbath begins. On the night of the 4th of July I went out in the dark and watched as the light from the distant fireworks illuminated the back of my house. I heard the explosions echoing in the distance. The brief flash of the fireworks can seem like the extent of our life here on earth. It burns intensely for a short while and then disappears in the darkness. Ceasing to exist. Tomorrow, if you should meet your death, will you be prepared to go before God for His judgement? Have you confessed your sins? Do you know what you will say to Him? Sometimes death comes suddenly and unexpectedly. Other times we slip slowly into death. We should not fear death, but we should be concerned enough that this leads us to make preparations for our soul. "Holy Mary, mother of God. Pray for us sinners. Now and at the hour of our death. Amen." The man that died was a homosexual living with the same partner for a number of years. As I pray for him, I wonder what is the state of his soul? I imagined him falling through the air. One time I had an experience where I was visiting a friend's home on a dark night and took a step back and fell off a porch. I had no idea how high up I was. It seemed like I was in the air for an eternity. I wondered if I was going to die. When I landed, it was on my back in some bushes. I jumped up and saw I was unhurt and realized at that moment how blessed I was. I thanked the stars, or God or the Creator for saving me. (At the time I wasn't a practicing Christian.) As it turned out I had only fallen a short distant of three or four feet. But it seemed almost like time stood still for that brief moment. I wondered if the man as he fell off the roof realized that he was going to die. Did he have time to confess his sins and ask for forgiveness? This is my prayer. I have faith that God is merciful and He will do everything possible to save every soul. He just asks us to trust in Him. Did the man have some Christian formation growing up that came to his mind? Was there someone who has been praying for him that helped to intercede on his behalf? 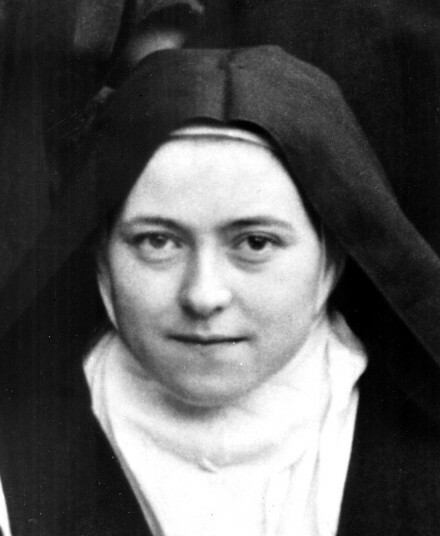 St. Thérèse once prayed for a man that was a condemned criminal. At the last moment before his execution he repented. St. Thérèse, little flower and Doctor of the Church, you promised to pray for our lost souls even more fervently once you were in the company of the angels in heaven. Send us a shower of roses. Pray for us, now and at the hour of our death. Amen. St. Thérèse, who said that her mission to make God loved will begin after her death, pray for us so that we may love Him more. "My dear Mother, I am a little brush that Jesus has chosen in order to paint His own image in the souls you entrusted to my care.... I am the very small brush He deigns to use for the smallest details." Just gazing at her picture can't you feel her transforming your heart, and bringing it into a more perfect union with the Sacred Heart of Jesus? I have been thinking of Saint Thérèse a lot lately; her image is comforting, when I think about her I think of a role model. I loved you article by the way, I do not comment as much anymore but I know every time I read the blog I will find something good every time.